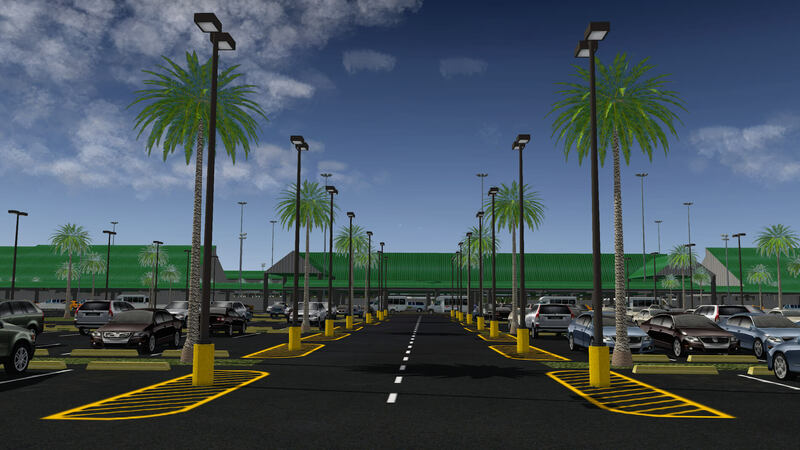 NAPS developers NAPS – Hans H. Gindra, Marc Leydecker, and Freddy De Pues – proudly present PHTO Hilo International Airport, Hawaii, USA. According to Freddy “This airport is the result of a compromise between eye candy and FPS. For instance, I deleted 40 neon lights from the terminal in order to prevent any damage to your CPU. This is my second attempt with a complex terminal in SketchUp with gazillions of polygons and FPS headaches with light fixtures. But the main change is in a new approach for SketchUp buildings by Marc: high rez textures, attention to details and lights (in smaller facilities). Now, besides the buildings I made and the time consuming landscaping, all the rest is a preview of Marc’s rendering of KPVG. I mean, a lot of buildings in Hilo were primarily meant for KPVG. These buildings and many others, with diverse objects, some animated, will become our private library, NAPS’ signature. Hans left his footprint on the upper tower and will be back full-time very soon. 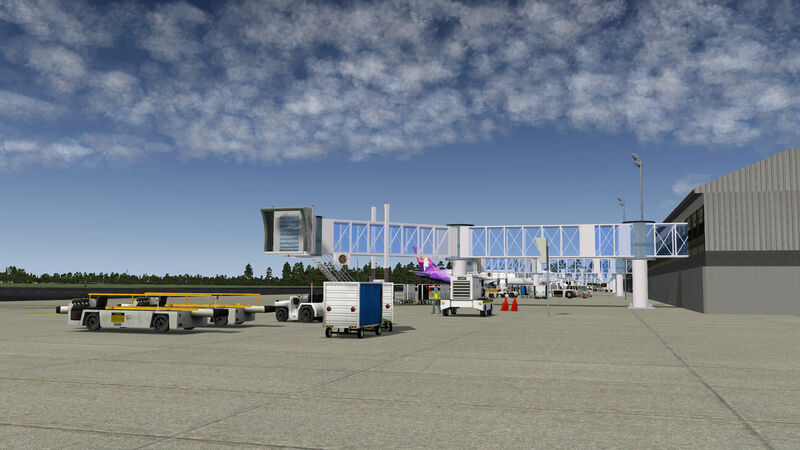 Version 2.0 is an airport created from scratch, v1.0 was deleted, so make sure you don’t run both at the same time. Having gone through the above features, let’s see what the NAPS PHTO Hilo airport is like. 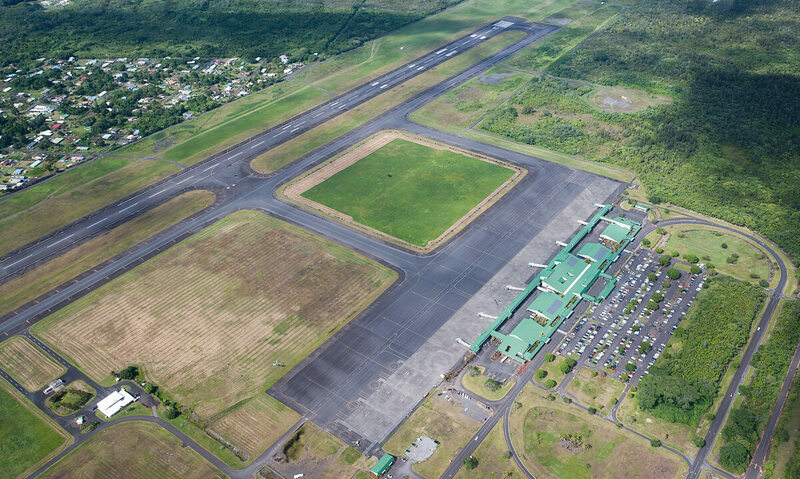 Hilo International Airport, formerly General Lyman Field, is owned and operated by the Hawaii State Department of Transportation. 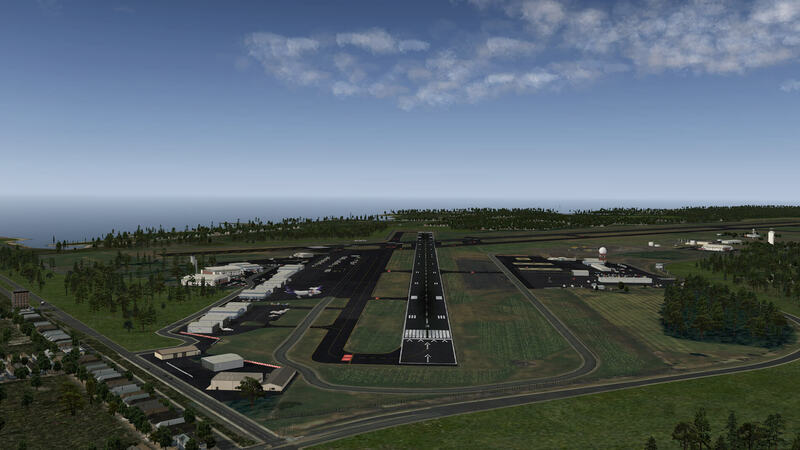 Located in Hilo, Hawaii County, the airport encompasses 1,391 acres (563 ha) and is one of two major airports on the Island of Hawaii (the largest in the Hawaiian chain) and one of five major airports in the state. Hilo International Airport serves most of Eastern Hawaii, including the districts of Hilo and Puna, as well as portions of the districts of Hāmākua and Kaʻū. Most flights to the airport are from Honolulu International Airport by Hawaiian Airlines and go! Mokulele. The photo below is courtesy of Airliners.Net. Want to read all about Hilo? Then I suggest that you check the dedicated Fred-E.Net Hilo web page (https://fred-e.net/2014/03/18/phto-hilo-intl-v2-0/). It covers a lot of real data and many other interesting things. You can also decide to check the official government owned Hilo website (https://hawaii.gov/ito) or check out the dedicated PHTO AirNav web page for additional airport information (https://www.airnav.com/airport/PHTO). Unpacked, the airport package is almost 220MB. 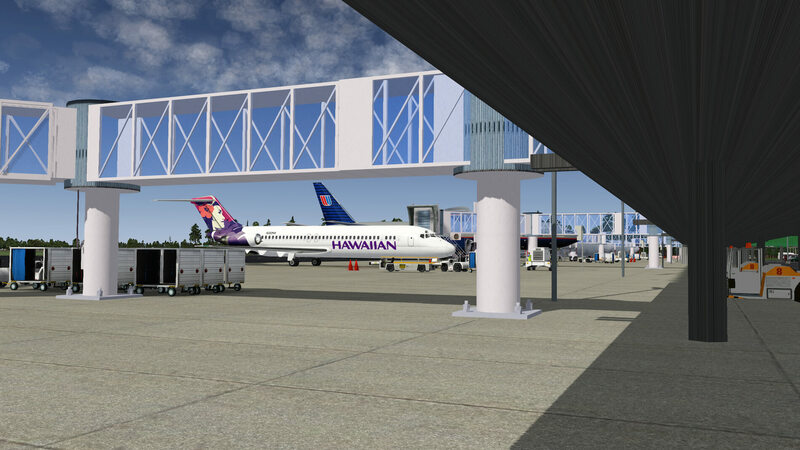 That seems not so much compared to Honolulu International Airport, but don’t forget that many elements are simulated and added to the airport. Perhaps even more important is that PHTO isn’t a big airport compared to their PNHL Honolulu International Airport. After you’ve unzipped it, it’s basically copy and paste the complete folder into the Custom Scenery folder. But you need more before you can use this airport. Before starting with an overview of what the “real” airport offers and hopefully also the NAPS version, it’s a good idea to take a look at the official ground map of PHTO Hilo Airport. This overview shows me that south of runway 26/8 we find the passenger terminal. This time the terminal is completely handmade and not a part of the Legobrick system. I was really curious as to how this handmade terminal would look. So, what else can we find at PHTO. From the passenger terminal we drive with a security car in a westerly direction along taxiway A to the cargo area and hangars. While driving along runway 26/8, we pass the fire station and the control tower. 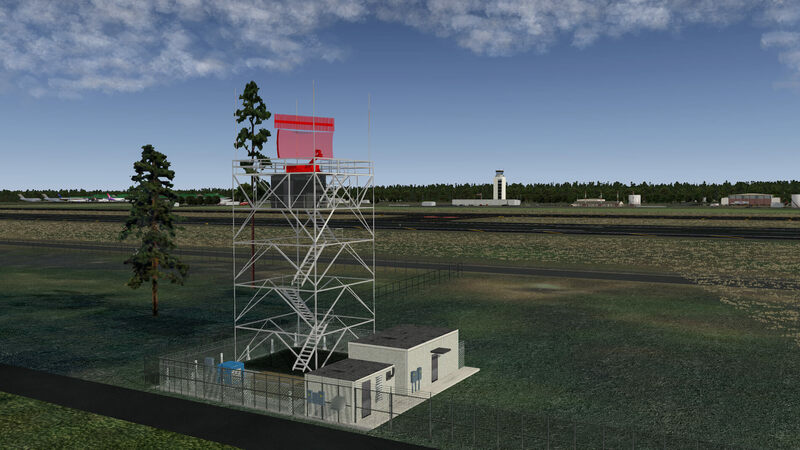 I can see that the modeled control tower looks very similar to the real one. Maybe the control tower is also handmade modeling? 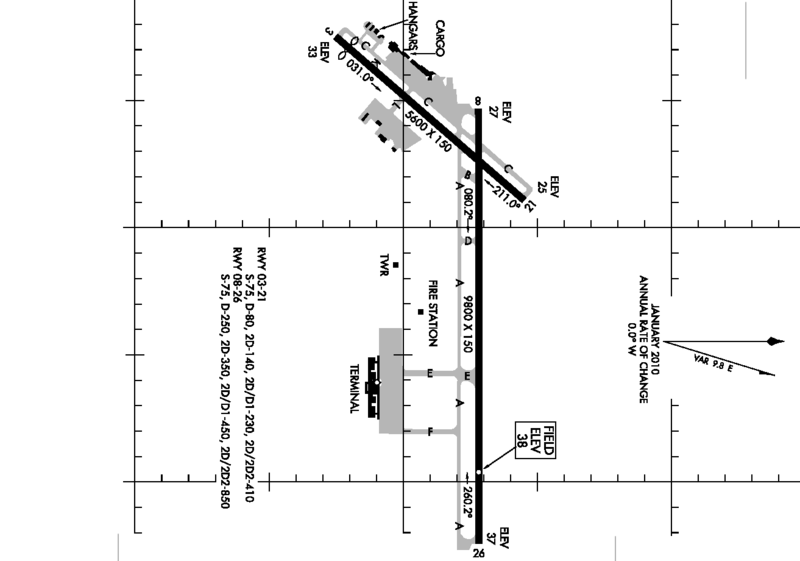 Using taxiway A, we cross runway 21/3 and drive on taxiway C along the western located apron of runway 21/3. Finally, my plan is to cross the runway once more and check out the eastern apron by way of taxiway L. And, that’s how the real PHTO is laid out. Now it’s time to check out what NAPS PHTO made of it. Come on, join me on my virtual PHTO NAPS trip. 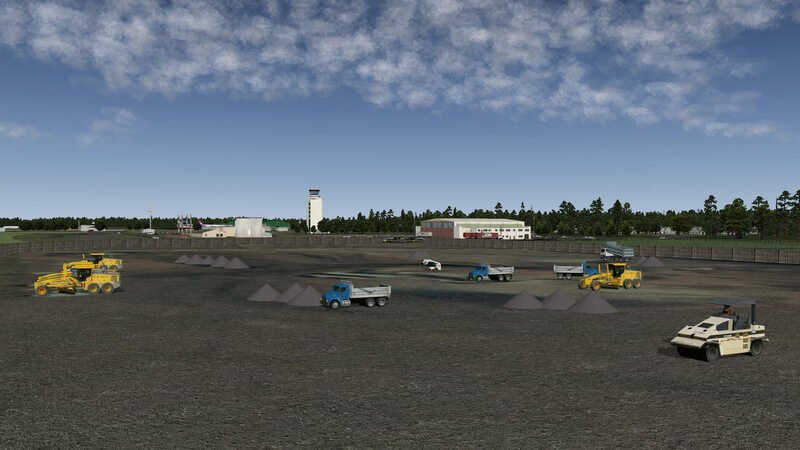 To give the runways a little more realistic look and feeling, I installed the previous mentioned “Asphalt Runways Enhanced HD” package. This makes the runway asphalt darker then the default XP10. 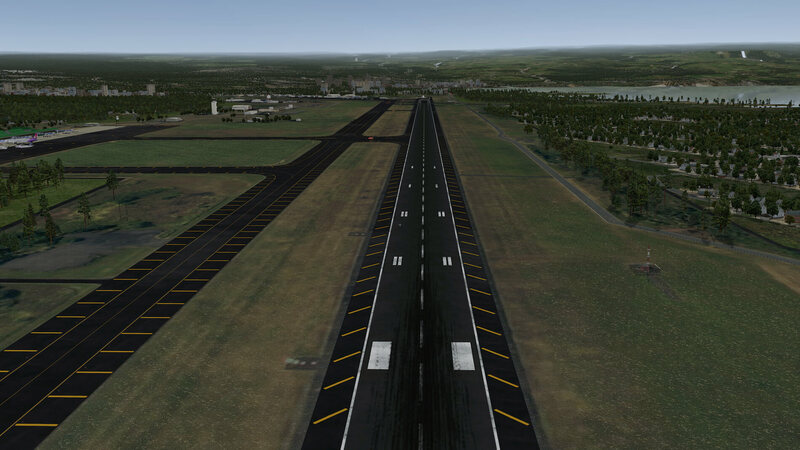 These darker runway and taxiways look in that respect more realistic when you compare it with the real PHTO airport. I’ve mentioned that the passenger terminal is completely handmade. If you compare a real photo of this building with the one that’s modeled, it looks more or less identical. 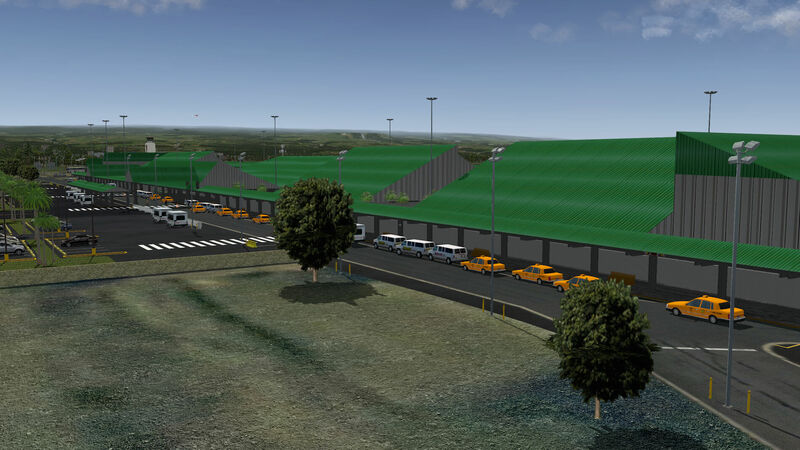 It’s the size of the terminal, the shape and the typical green roof. 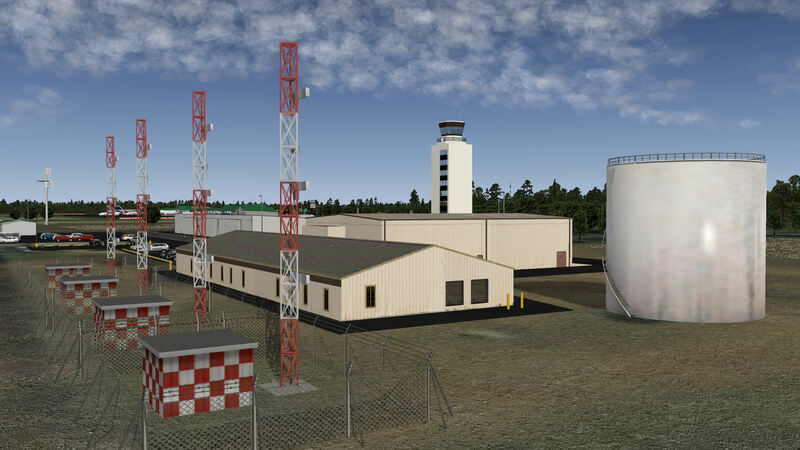 Add to this jet ways, realistic ground apron textures, fences on the outside of the airport, photo real ground textures and palm trees along with an assortment of ground equipment objects and you’ve got a fairly realistic PHTO. There’s only one small item to remark on. As far as I can judge from some real photos, the side walls of the building sections are medium to dark gray while it seems to me that the real buildings are more off white colored. It’s not really a big issue since I’m already very happy with the way this passenger terminal looks. 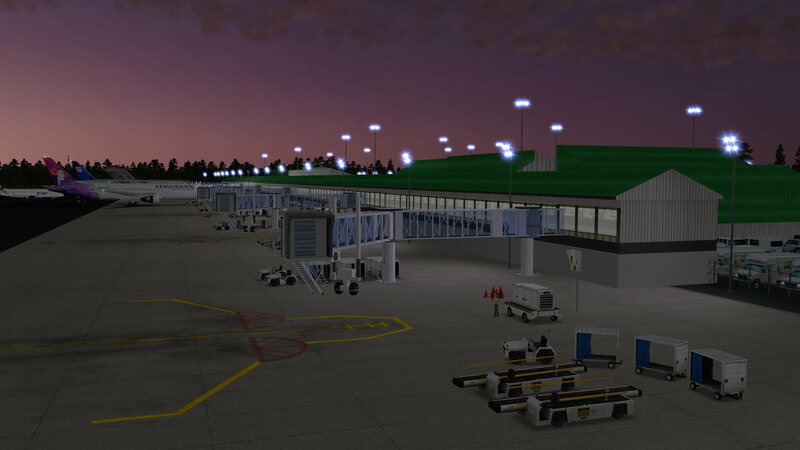 It’s handmade and gives the overall passenger terminal and apron an impressive look and feeling. That quality look and feeling doesn’t end with this terminal. There’s much more. 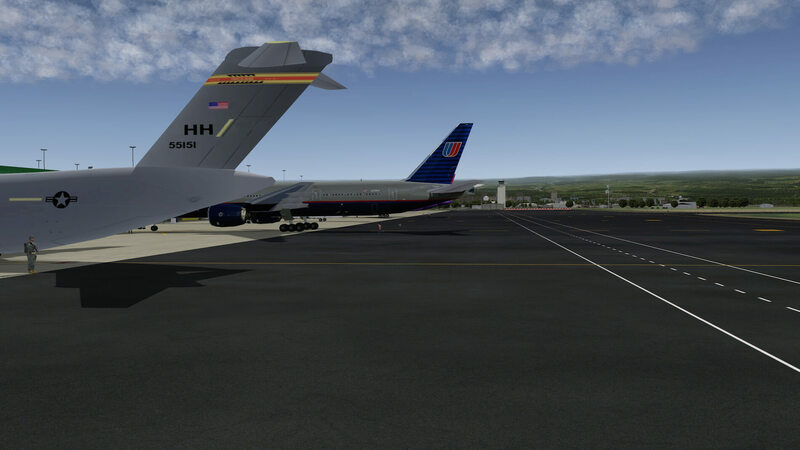 On the apron you’ll find a total of 7 jet ways of which three are occupied by static aircraft: 767 Hawaiian, 777 United Airlines and two C-17 Globemaster III, one of which is parked at a jet way position. The jet ways could be animated, but only if you install the additional plugin. 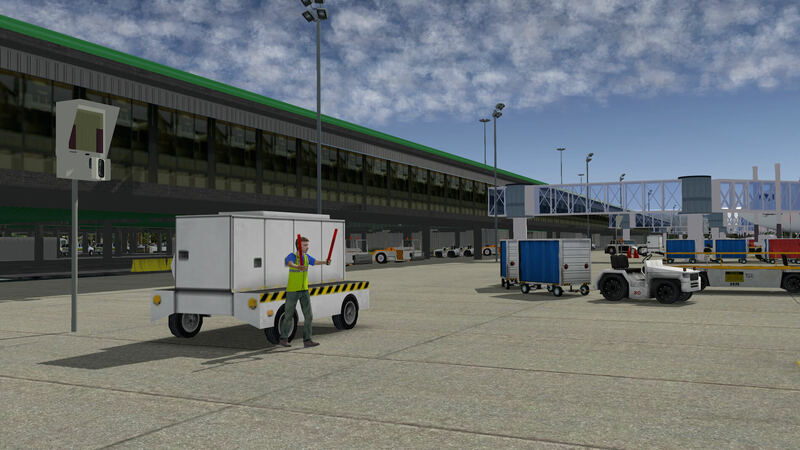 On the apron you’ll find plenty of ground equipment objects like containers, GPUs (Ground Power Unit), baggage belts, push back trucks and others. It’s not filled with too many objects. What you’ll see is a nice and realistic balance between what you may expect to see at an apron. Almost forgotten, there are animated marshallers and static persons near the static aircraft. While visiting the public side of the airport fence at the entrance and car parking lots, it’s seems it’s a busy day. You’ll find some taxis waiting for passengers, some car rental buses, a police car, hotel courtesy buses and a realistically modeled car parking lot. 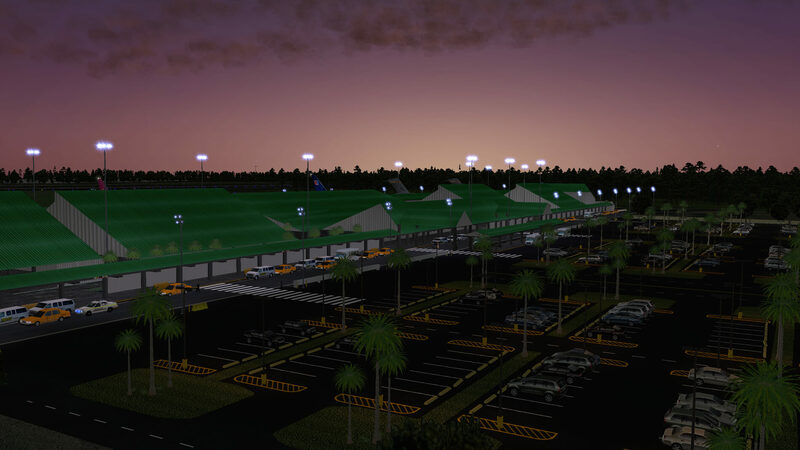 It’s not just the parking lot that’s interesting to check out, it’s the presence of the 3D cars, the palm trees, the lights, the ground textures and the fact that it’s a 24-hour parking lot. Good to know if you’re out for a couple of days! Concerning the way passenger terminal has been designed and modeled, I’m very pleased with the way that’s been done. Now, it’s time for a quick drink at the Blue Skies Grill and while visiting this building at the far end of the passenger terminal, I can also have a look in the Pilot Shop. This small “simple and straight forward looking” building is made with the help of photo real material and because of this, it looks very realistic. 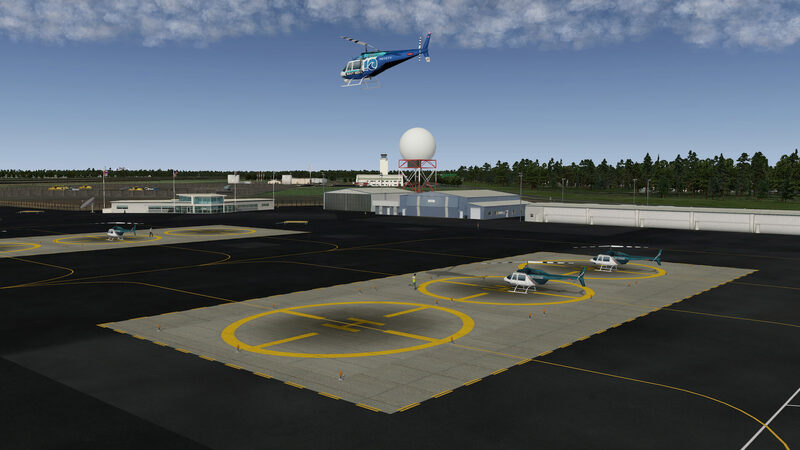 Near this side of the apron, you’ll find some helicopter spots of which only two are occupied. In other words, if you want to arrive with a heli at PHTO, there’s enough space for you to do that. 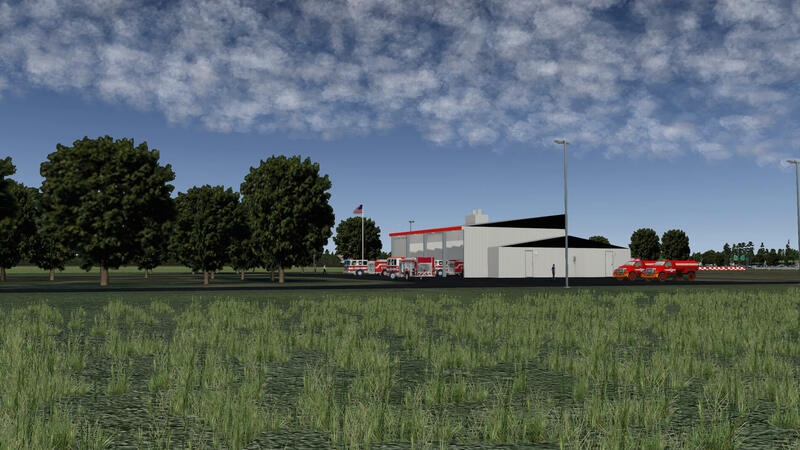 Driving along taxiway A, I’m heading in the direction of the other two aprons, but along the way, let’s have a quick look at the fire station and control tower. 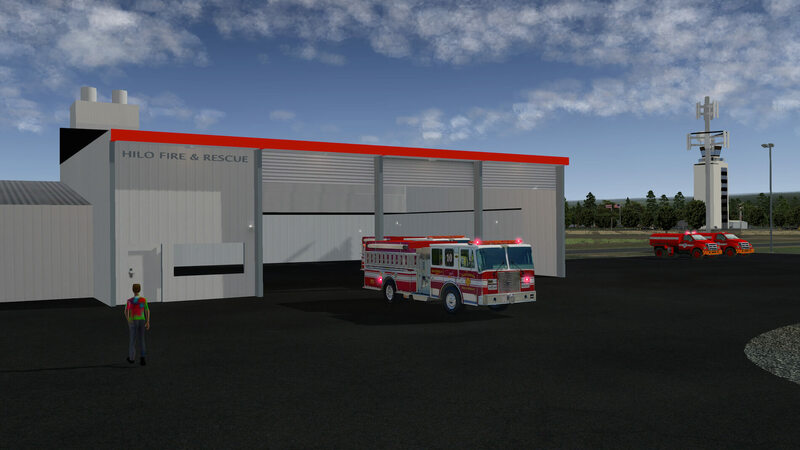 I’m not sure if the fire station building is handmade, but it looks good and it seems there’s no reason for the fire brigade to do anything, since almost all fire trucks are at their home base. A little further on is the handmade control tower. I’ve seen many Legobrick control towers, but this one looks very similar to the real tower and since it’s handmade, looks very good. It’s not only the control tower that gets my attention. It’s also the area around it. 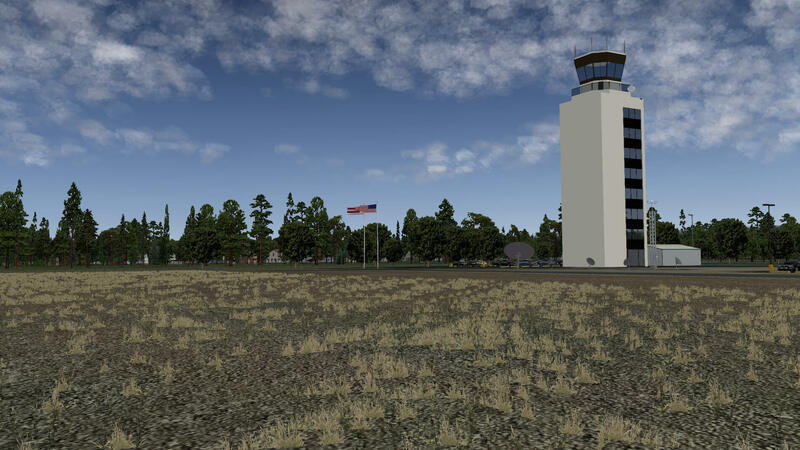 You’ll find some flags, some small car parking lots, weather ground equipment and other hangars and buildings along with a variety of miscellaneous objects. As I approach runway 21/3, I notice that there is groundwork activity on my left. I’m not sure what will come here in the near future, but for the moment, construction is on its way. I’m really happy with these tiny things. Although the construction equipment are pure static objects, I can see that a lot of time and effort has been put into the creation of this airport, but that’s pretty much the same for every NAPS airport. Anyway, time to cross 21/3 to visit GA and cargo aprons. After I received the clearance to cross 21/3, I’ve reached one end of the apron. It looks quite obvious to me that this part of the apron is dedicated to GA aircraft. You can’t miss all of the GA aircraft. I quickly counted 33. Here and at the passenger terminal, it seems that even with all of those static objects there’s not a big frame rate impact. I could write that there was no frame rate impact, but that could be as a result of my new high-end iMac (iMac Late 2013 with Intel Core i7 3.5Ghz – 3.9Ghz during boost, 32 GB 1600 MHz DDR3, NVidia GeForce GTX 780M 4096 MB and a 1TB SSD). Anyway, with so many GA aircraft parked at their designated spots, it will need some skills to park on those spots that are left open. 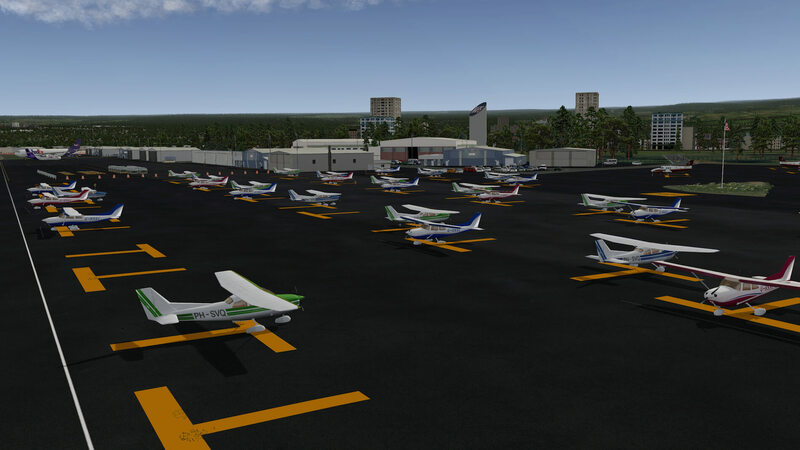 On the edges of this part of the apron, you’ll find some hangars and car parking lots. It feels strange to see cars parked at the apron, but I’ve seen this at many airports. 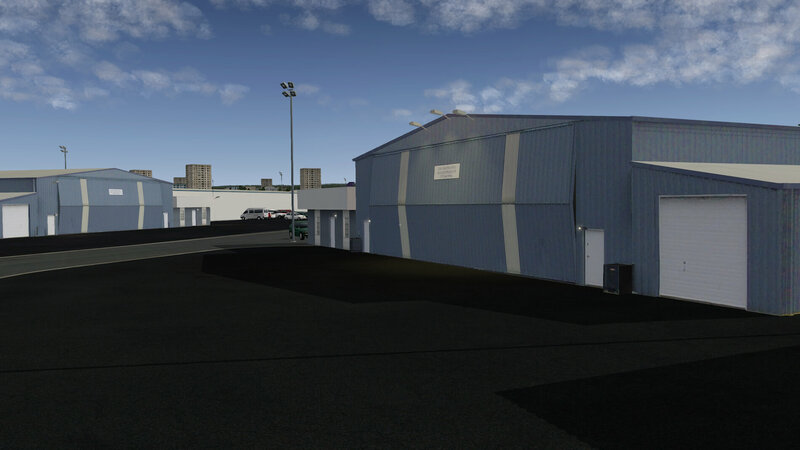 Walking from this area to the other side of the apron, you’ll reach the cargo terminal. Well really, terminal isn’t really the correct word. 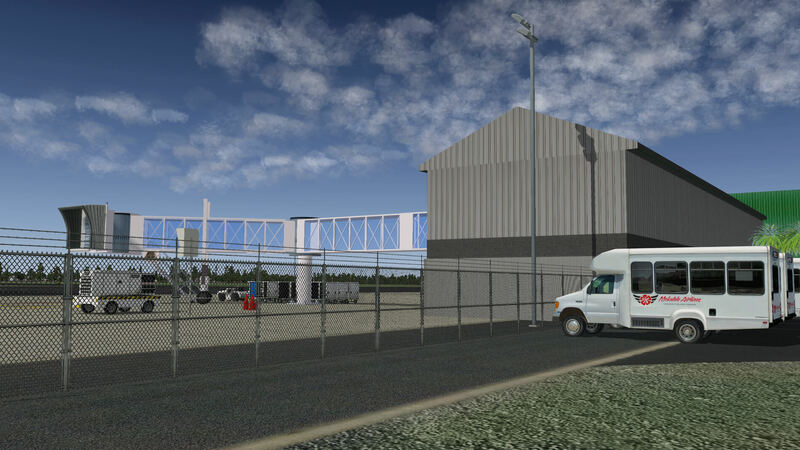 It’s more an area that offer hangars, cargo terminals and a couple of parked FedEx aircraft. If I’m not mistaken, it seems to me that those aircraft are a FedEx ATR and an Airbus A300. With some static people standing at the apron and other ground equipment, it fills the empty area very nicely. Near the Airbus A300 I see a baggage belt, but I miss the presence of a high loader. Perhaps that could be added to this side of the apron in a future Service Pack. A little more “cargo” or “freighter” ground equipment would also be welcome. 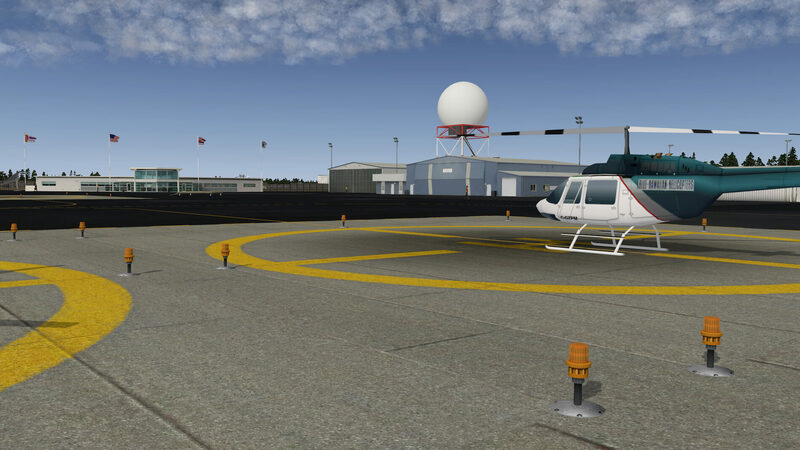 Just when you think this apron has ended, you’ll be surprised to find that there’s a small area right behind it with some hangars and static objects such as private jets and static people. You shouldn’t forget the other side of the hangars and buildings. That other side is outside the airport fence and offers car parking, some additional hangars and other elements. Now, let’s check out the apron on the other side of runway 21/3. It seems to belong only to helicopters, since I only see helicopter spots. And, very interesting, animated helicopters. What does this mean? I counted a total of two of those animated and flyable helicopters. Without my doing anything, they lift off, make a turn and land back on the same spot. It seems that the pilot’s are testing the helicopters. 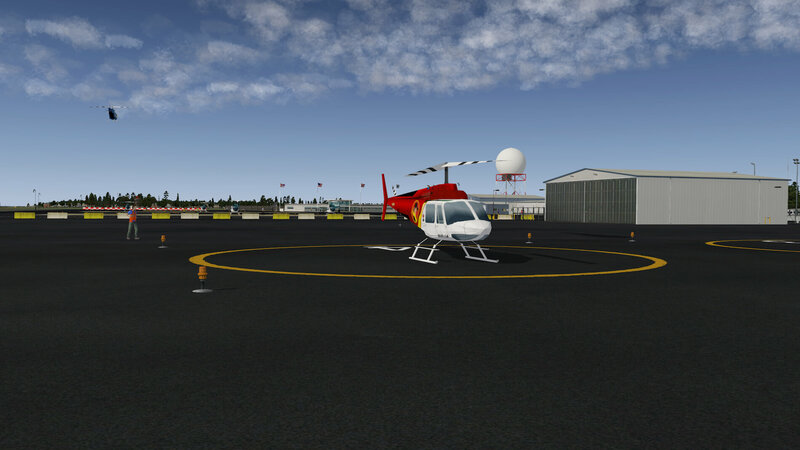 This large apron is divided into a red heli area and a blue heli area. Further on, you’ll find static objects like Total fuel trucks (I wonder if Total really exist in Hawaii), static persons and other items. 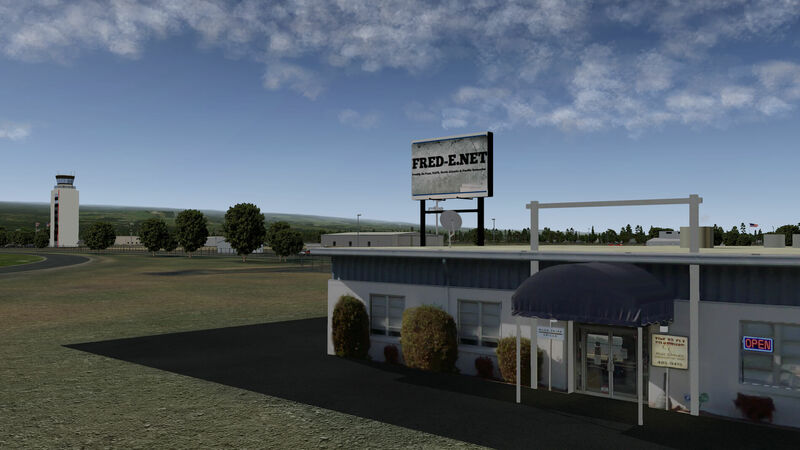 Naturally enough, there are all different type of hangars, a Fred-E.Net billboard, car parking lots, flags, and a heli passenger terminal building. At least that’s what it looks like to me. 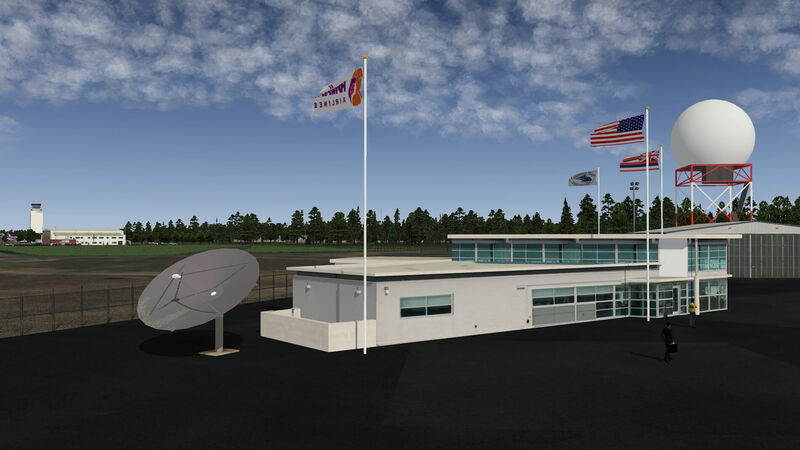 Near the passenger building is situated a radar installation and a couple of other objects. Overall, a quite interesting apron with a lot of features and perhaps even some hidden features. This is really a pleasure to see. Ahhh, what’s a pleasure to see? Not only at NAPS Hilo Airport, but as far as I know, the team used ortho material for ground textures with every NAPS airport. Of course, it all depends on whether you can get good quality ortho material for making ground textures. 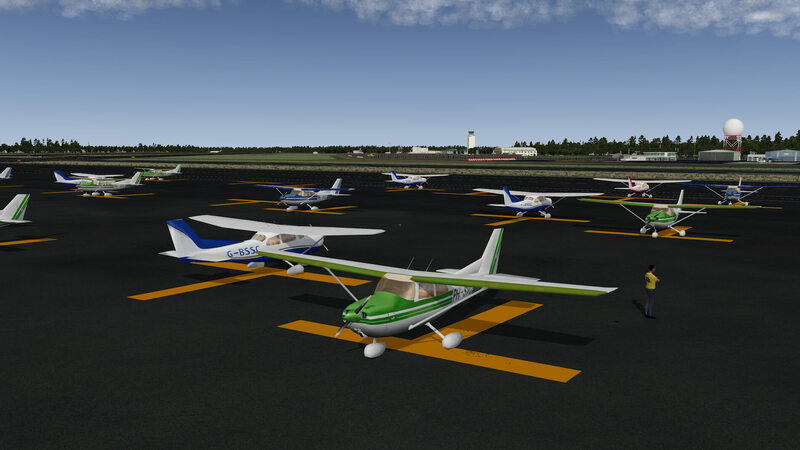 But if you can, I would suggest that every XP airport builder adds these ortho ground textures to their airport. 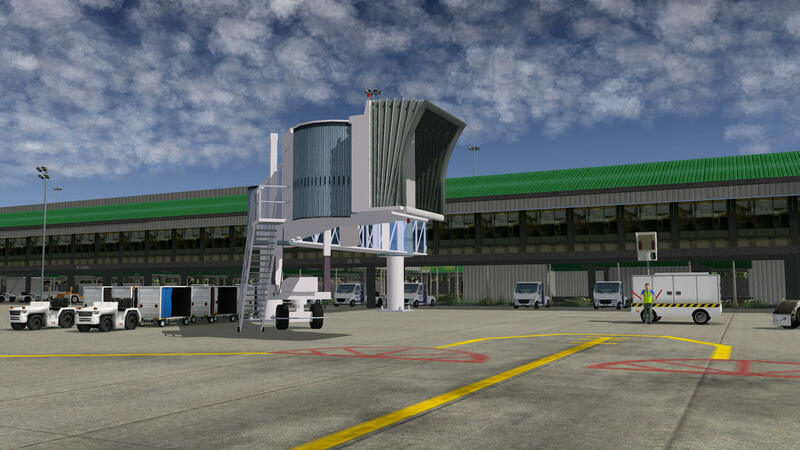 It gives the airport a totally different and more realistic look. It’s not always very visible when you’re on the ground, but from 300 feet above the ground it sure is. When the developer adds 3D grass to this, it makes the overall look even better. While driving from one end to the other end of each runway, I carefully monitor the taxiway and runway markings and the taxi/runway signs. I’m not sure how the real airport markings are, but I think that the taxiway and runway markings could have been a little more weathered. As it is now, it looks as if the markings are just painted which is most likely not the case in real life. Disappointed? Not at all! It’s just a suggestion for the NPS team. I think, hovering at a certain altitude above the airport, that I can spot the boundaries of the NAPS airport and the default XP scenery, but it’s difficult to see. 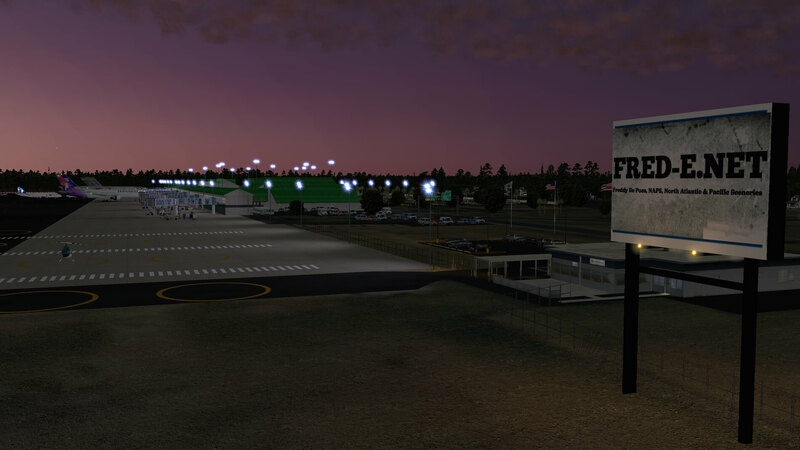 Even so, the team did a great job in blending the airport ground textures with the default XP10 ground textures. And, while hovering at this altitude, which can be seen on the following screen shots, you’ve also got a good view of the implemented ortho ground textures. Well done! And finally, some bonus evening screen shots. When you’re able to tick “HDR” lighting, you will be surprised who it all looks during the evening hours. Suddenly, Hilo is worth to make a landing during early morning hours or just before sunset. Check it out! First of all, it’s free of charge. That means you can always download it and check it out without and financial worry. If you don’t like it, which I can hardly believe, you can always delete it from your Custom Scenery folder. If you have to reduce your Rendering Options, do so and then see if you’re still happy. 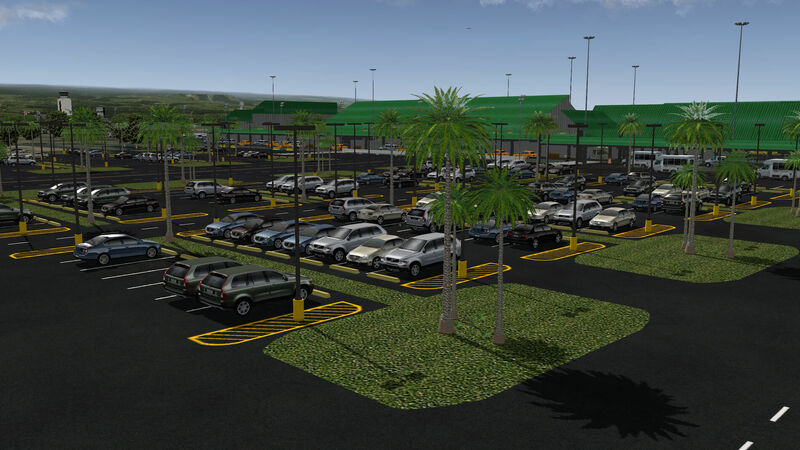 In any event, if you have a high-end PC/Mac, then you should go for this Fred-E.Net / NAPS Hilo international airport. Believe me, it’s worth it! Besides this Hilo International review, I’d already reviewed the NAPS/Fred-E.Net Honolulu International Airport. You can read this comprehensive review/impression using this link (https://asn-xp.aerosoft.com/?page_id=7036). But why did I want to highlight those four Hawaiian airports? Not only to promote the great work of the NAPS team, but also to let you know that flying in and around Hawaii is fun. You’ve got four NAPS airports to land or depart from and also see something of the islands. You’ll have a wonderful Hawaiian adventure! Lets me make a promise to myself and to all XP simmers. Within a couple of weeks I’ll release a Hawaiian flight adventure. The flight adventure will cover the NAPS/Fred-E.Net airports PHTO – PHHN – PHOG – PNHL. Did I cover every corner of the airport, inside and outside the airport fences? I’m sure I’ve overlooked certain areas, but I think the majority has been covered and should give you a good idea of what to expect. Feel free to contact me if you’ve got additional questions related to this impression. You can reach me via email Angelique.van.Campen@gmail.com.